Unlock Limitless Creativity and Create Masterful Sketches with this Elite Artist Sketching Set. Everyone has artistic potential, but in order to make that potential come to life, you need the right tools. No one knows this better than Bellofy - we're artists, too, and we've designed these sketching supplies with artists of all levels of experience in mind. Bellofy's elite sketch kit blends comfort, quality, and durability so that you can achieve expert-level shadowing and shading with reliable, long-lasting tools. When you purchase Bellofy sketching supplies, you receive tools that are designed to let you draw all of your artistic visions into creation. - A SKETCHPAD so that you don't have to wait to create your next masterpiece - start sketching right away! 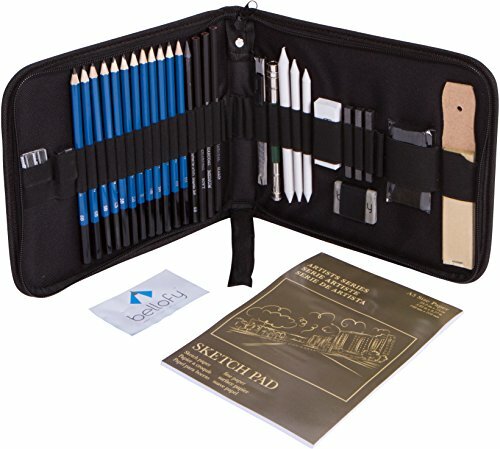 Craft beautiful and unique drawings with the #1 top-quality professional sketching and drawing set. Click "Add to Cart" now to order this kit for yourself or as a gift for your favorite artist! A WIDE VARIETY OF SKETCHING PENCILS to master all ranges of shading with each of the following pencils included: 8B, 6B, 5B, 4B, 3B, 2B, B, HB, 2H, 3H, 4H, and 5H. All the Sketching Supplies You Need! If you have any questions about this product by Bellofy, contact us by completing and submitting the form below. If you are looking for a specif part number, please include it with your message.